According to the American Cancer Society a total of 1,660,290 new cancer cases and 580,350 cancer deaths are projected to occur in the United States in 2013. Malignant neoplasms are currently a leading cause of death in the country, second only to cardiovascular diseases. Studies show that one in every four deaths in the U.S. is due to cancer. Even though progress has been made in treatment and care, the number of cancer cases worldwide is expected to increase to 21 million in 2030, causing more than 13 million deaths. In the face of this major public health problem, many leading agents, from the public and private arenas, are engaged in research and development activities aimed at achieving an eventual cure. Federal R&D Tax Credits are available to support credit eligible cancer innovation activities. In addition to providing tax credits for cancer innovation activities, the U.S. Federal Government currently supports several cancer research initiatives. 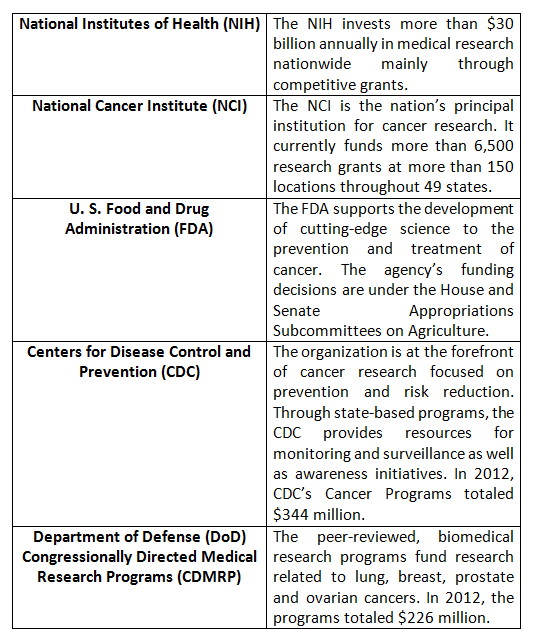 The following table summarizes Federal agencies and programs that provide cancer research funding . Characterized by the malfunction of genes that control cells growth and division, cancer is a group of diseases marked by the uncontrolled multiplication of abnormal cells that result in the formation of malignant tumors. Medically known as malignant neoplasm, the disease can be caused by both external factors, such as chemicals, radiation, tobacco, and infectious organisms, and internal conditions, namely, hormones, immune conditions, and inherited or metabolic mutations. Risk factors also include obesity, unhealthy dietary habits, lack of physical activities, alcohol use, sexually transmitted HPV-infection, among others. Most commonly, cancer treatments include a combination of interventions, such as chemotherapy, radiation therapy, and surgery. Biological therapy, targeted therapy, hormone therapy, and palliative care are also available for cancer patients. The choice of treatment is determined by the stage of the disease, in other words, its extent or spread at the time of diagnosis (tumor size and eventual spread to other parts of the body). According to the World Health Organization , lung, stomach, liver, colon, and breast cancers are responsible, in this order, for the most cancer deaths. The major cause of death from cancer is denominated metastasis, a process through which abnormal cells grow beyond their originating site, spreading to other parts of the body. Cancer research currently involves agents from different spheres. The American Association for Cancer Research is an interesting example of this diversity: with more than 34,000 members, the organization gathers medical centers, laboratories and clinics, government, universities, and industry. Investigation of causes: such as critical cell types for cancer growth, oncogenomics, and in vitro research. Investigation of treatments: such as vaccines, gene therapy, targeted therapy, and photodynamic therapy. For the first group, an interesting example is the recent discovery of more than 70 new susceptibility loci (alterations in genomic regions) for prostate, breast, and ovarian cancers. The Collaborative Oncological Gene-environment Study (COGS)'s findings represent a major step in the characterization of the genetics of cancer and the understanding of inherited susceptibility. The mega-study analyzed more than 200,000 individuals and will allow for the development of more effective preventive initiatives, such as targeted screenings . Concerning the investigation of treatments, there is a significant number of experimental drugs currently undergoing clinical trials. 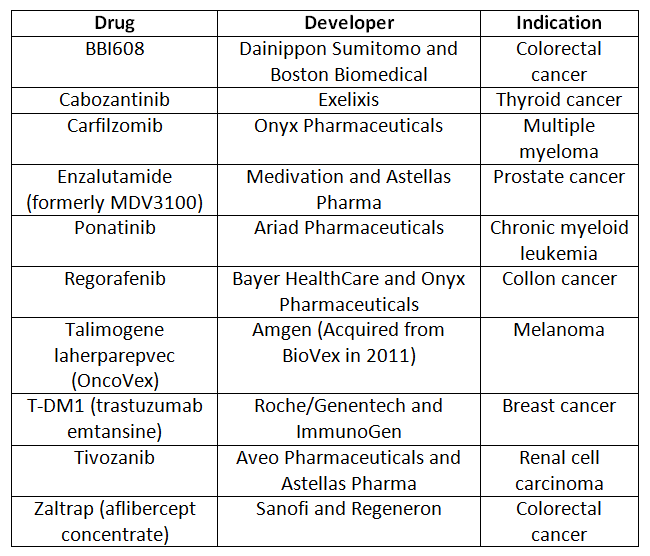 FierceBiotech recently published a list of "Top 10 Late-Stage Cancer Drugs" , gathering what are considered to be the most promising cancer research programs, based on safety and efficacy data. In an era of ever-evolving technology, cancer R&D is not restricted to the development of drugs or genetic investigation, comprising a wide range of related innovation. The Wall Street Journal recently presented a promising initiative that aims at using "Big Data" to increase effectiveness of cancer care . A major driver of innovation and job creation, "Big Data" is defined as large data sets that are too large and complex to be analyzed by conventional means . The project, launched by the American Society of Clinical Oncology, will pool patient records in an electronic database allowing doctors to evaluate treatment strategies based on how similar patients nationwide have responded. Even though there are numerous challenges to be overcome, such as patient privacy and data limitations, the potential benefits are enormous since virtually all patients would become contributors to an unprecedented clinical study. This revolutionary access to information is likely to change the face of cancer care and, eventually, medicine. The revolutionary use of Big Data in cancer diagnosis is also on the horizon. IBM's Watson, a language-proficient computer system initially created to answer questions on the show Jeopardy!, has the ability to assimilate and analyze an enormous quantity of data. Its cumulated "knowledge" includes "more than 600,000 pieces of medical evidence, more than two million pages from medical journals and the further ability to search through up to 1.5 million patient records", an amount of information no human doctor's mind can match. IBM, in partnership with the Memorial Sloan-Kettering Cancer Center in New York and the American private healthcare company WellPoint, is working to enable oncology hospitals, clinics, and individual doctors to rent time with Watson over the cloud. Watson's wider deployment would significantly increase accuracy of diagnoses while simultaneously reducing costs. When tested for lung cancer diagnoses, Watson's success rate was 90%, compared to an average of 50% for human doctors. Similarly, Brain Mapping activities are bound to open the way for new advancements in cancer research. The personalized diagnostics for brain tumor patients and the consequent possibility of performing more precise surgeries figure among the potential benefits. Brain Mapping techniques will prevent damage to language, visual, and motor functions when removing cancerous tissue. With a $3 billion U.S. commitment announced in 2013 called BAM (Brain Activity Mapping) and an incredible amount of University research now occurring in this domain, one should expect major progress in brain tumor treatment. The world anxiously waits for the end of the affliction of cancer. Genetic discoveries along with drug development and the use of new technology to improve care are examples of advancements due to recent R&D activities. Federal tax credits and funding are available to open the way to more innovation.